1 Sunny with few Ci. Top Tmax: Ghent 23,8°C, Zaventem had 21,4°C. 2 All deep blue skies. Top Tmax: Kleine Brogel 22,9°C, Zaventem had 20,2°C. 3 Sunny with during afternoon some fair weather Cu. Top Tmax: Kleine Brogel 23,8°C, Zaventem had 21,2°C. 4 Starting sunny with some Ci, from afternoon more thicker Ci patches followed by As & some Ac, later also some Cu. A few rain drops fell around 1700. Top Tmax: Kleine Brogel 23,4°C, Zaventem had 22,1°C. Late afternoon a weak thunderstorm over province of Oost-Vlaanderen. 5 Very cloudy with St Sc between 0530-0900, later breaking & dissipating leaving some Ci. Top Tmax: Kleine Brogel 23,8°C, Zaventem had 20,6°C. 6 Starting quite sunny with lots of Ci, Cs, afternoon also Ac As. Few spots of rain around 1900, after sunset also Sc. Top Tmax: Kleine Brogel 21,9°C, Zaventem had 19,1°C. 7 Intermittent light rain & drizzle between 0300-2200 giving 4 mm. Top Tmax: Charleroi 16,6°C, Zaventem had 15,3°C. 8 Starting with some breaks, (light) rain between 1300-1500 giving 2 mm. Top Tmax: Ghent 16,8°C, Zaventem had 15,6°C. Today, in afternoon, weak thunderstorms over provinces of Luxembourg & Limbourg. 9 Overcast with rain & drizzle between 0000-2030 giving 7 mm. Top Tmax : Ghent 14,7°C, Zaventem had 13,5°C. 10 Very cloudy with Sc, Ac, As, Ci, Cs & light rain 0700-0900 =1 mm. Top Tmax : Liège 20,0°C, Zaventem had 17,8°C. 11 Light showery rain between 0200-1100 giving 3 mm. Quite gusty in morning with peaks up to 45KT. From noon on breaking clouds & becoming cumuliform. Renewal of light rain after 2200. Top Tmax: Charleroi 17,3°C, Zaventem had 16,6°C. Top gust: Ostend 49KT, Spa, Chièvres & Charleroi 47KT, Beauvechain & Zaventem 45KT, Deurne, Ghent & Liège 43KT. In morning, mean speed reached along coast gale force and offshore even strong gale force. 12 Showery rain or showers between 0000-1400 giving 5 mm, afterwards large breaks but again tempo light rain around 2200. Top Tmax: Charleroi 19,1°C, Zaventem had 17,0°C. Early morning a couple of weak thunderstorm over province of Hainaut. 13 Starting with nice breaks in Sc, soon invading Ci, Cs As with light rain between 1130-1300. Afterwards clearing skies. From 1600 on again increasing As with mamma features. From 1700 thunder was heard in W and between 1730-1740 a short but heavy thunderstorm with hail (around 1 cm) & blustery winds up to 43KT, giving 7 mm. Pictorial weather report can be found here. Afterwards again large breaks. Top Tmax: Liège 23,3°C, Zaventem had 20,3°C. Today, late afternoon & early evening a squall-line with moderate to local heavy thunderstorms passed Belgium. Most activity was over central & eastern parts. Wind and water damage was reported, for example in Halle (Brussels). At Monceau en Ardenne (province Namur) hail stones of up to 3 cm came down and the observed wind damage might have been done by a weak tornado but could also be related a downburst as no typical tornado hookecho signature was found on the radar images. 14 Partly cloudy to cloudy with Cu Sc, afternoon towering Cumulus with light showers around 1530,1900 & 2130 giving 2 mm. Top Tmax: Kleine Brogel 18,9°C, Zaventem had 17,7°C. 15 Starting quite sunny with some Ci, during forenoon more Cu, during afternoon TCu with a light shower around 1430. Afterwards more cloudiness in form of Sc & Ac. Top Tmax: Top Tmax: Kleine Brogel 18,0°C, Zaventem had 16,4°C. 16 Rain & drizzle, sometimes moderate between 0100-1130 giving 13 mm, afterwards breaks with Cu & Ci, Cs. Top Tmax: Kleine Brogel 17,0°C, Zaventem had 15,4°C. Today, during early afternoon, a couple of weak thunderstorms over provinces of Antwerp & Limbourg. 17 Rain & drizzle till 1100 giving 8 mm. Later breakings clouds in Cu Sc. Top Tmax: Chièvres 16,8°C, Zaventem had 16,0°C. 18 Cloudy to very cloudy with Cu Sc. Light showers around 1900, showery rain from 2130 on giving 7 mm by midnight. Top Tmax: Kleine Brogel 23,5°C, Zaventem had 22,5°C. 19 Some rain between 0200-0400 giving 5 mm. Later breakings clouds with fair weather Cu, clearing towards sunset. Top Tmax: Kleine Brogel 20,1°C, Zaventem had 18,6°C. 20 Starting sunny, soon invading Ci, Ac As. Light rain 1300-1500. Again light rain 1800-2200. Total amount was 5 mm. Top Tmax: Elsenborn 21,2°C, Zaventem had 16,9°C. Today, during the evening, some weak thunderstorms over province of Luxembourg. 21 Starting grey & misty, breakings clouds late afternoon leaving Ci, Cs. Top Tmax: Elsenborn 25,4°C, Zaventem had 20,3°C. Today, during the evening, a couple of weak thunderstorms over provinces of Namur and eastern part of Vlaams-Brabant. 22 Fog between 0400-0800. Afterwards staying grey and misty, some brief breaks around 1600, but afterwards remaining very cloudy with Sc. Top Tmax: Elsenborn 23,2°C, Zaventem had 18,8°C. Today, during afternoon, weak to moderate thunderstorms over province of Liège. 23 Sunny, with tempo a few Cu. Top Tmax: Kleine Brogel 23,9°C, Zaventem had 21,6°C. 24 Sunny, towards midnight lightning over far SE. Top Tmax: Kleine Brogel 27,5°C, Zaventem had 24,6°C. Today, during evening, weak to moderate thunderstorms over provinces of Namur, Luxembourg & Liège. 25 Partly cloudy to cloudy with Cu, Ac. After sunset some lightning in SE. Top Tmax: Kleine Brogel 26,7°C, Zaventem had 25,5°C. Today, during afternoon, weak to moderate thunderstorms over eastern part of Liège. After sunset more thunderstorms over provinces of Namur, Liège, Luxembourg, Limbourg and eastern parts of Brabant & Hainaut. Some were severe (due to lightning) like over provinces of Namur & Liège. 26 Overcast with St Sc, around 0245 tempo moderate rain giving 4 mm, later some slight rain. Breaking cloudiness from 1800 on. Towards midnight two rumbles of thunder were heard. Top Tmax: Elsenborn 22,8°C, Zaventem had 17,8°C. Today, from evening on, weak to moderate thunderstorms over provinces of Hainaut, Namur, Luxembourg, Liège, Brabant Oost-Vlaanderen & Limbourg. Some were severe due to intense lightning. 27 During the night showery rain giving 6 mm. Daylight period cloudy to very cloudy with Cu Sc. Between 2100-2300 some light rain giving 0,5 mm. 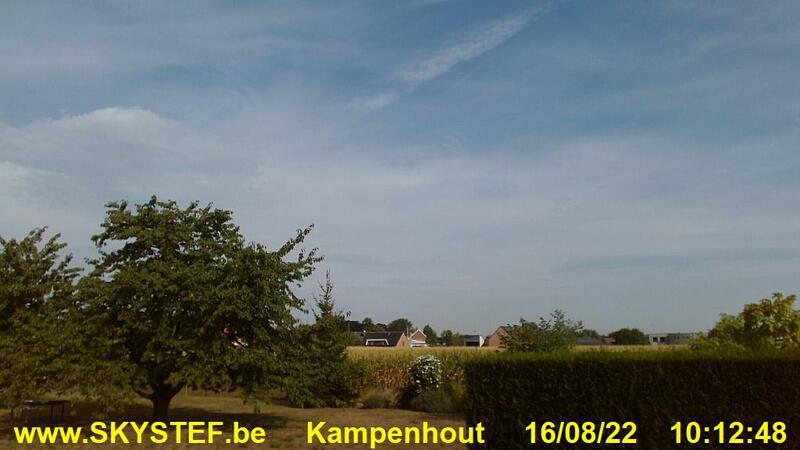 Top Tmax: Kleine Brogel 18,4°C, Zaventem had 17,8°C. Today, during first part of night, weak thunderstorms over province of Namur. 28 During the night (s)light rain = 0,5 mm. Some sunny spells in morning hours, later mostly very Sc Ac As Cs cloudy with sometimes a few raindrops. Top Tmax: Deurne 18,3°C, Zaventem had 15,3°C. 30 Staring sunny, later some Ci, from noon also Cu, after 1600 Sc Ac. Top Tmax: Kleine Brogel 21,4°C, Zaventem had 19,2°C. 31 Some rain between 0100-0600 giving 4 mm. Afterwards breaking cloudiness, during the day building Cu with a couple of showers between 1600-2000. Top Tmax: Kleine Brogel 22,2°C, Zaventem had 19,1°C. Today, during afternoon, a few weak thunderstorm over provinces of West- & Oost-Vlaanderen, Brabant and Liège.